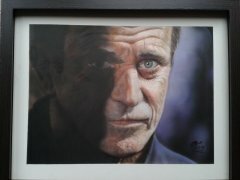 I am often asked 'how do you construct these paintings and what techniques do you use ?" In this section I will attempt to answer , my methods explained here are not necessarily the proper or best way, but just what works for me through trial and error. 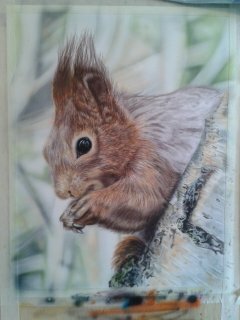 The example I will use here is the Red Squirrel as most people ask "how do you do 'fur'?" I will add further step by steps for different subjects later. 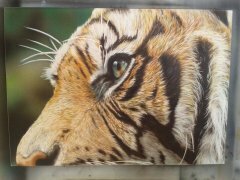 Step 1: the first thing I do is roughly sketch out the subject to establish the main reference points such as the eyes, ears, mouth , nose and direction of fur ; after all we want the final painting to look like the reference . 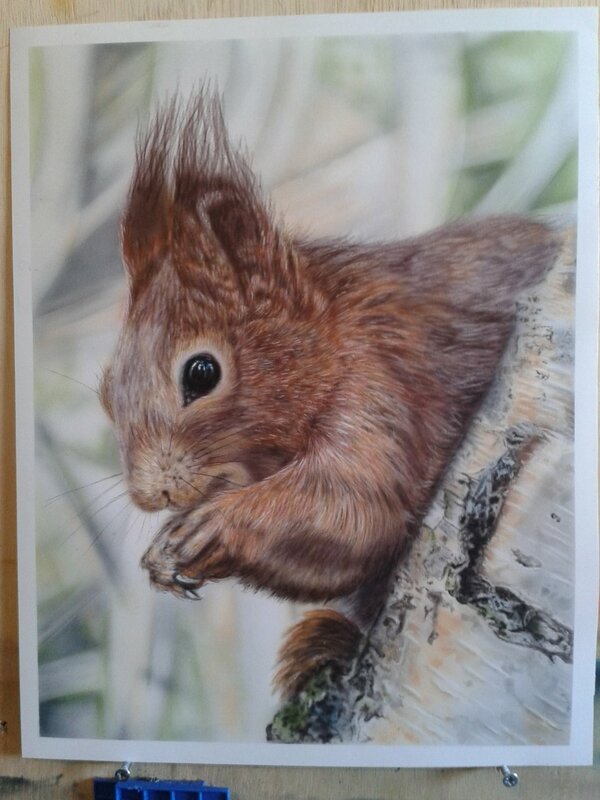 Step 2: I will now usually do the background first mainly because you can almost guarantee hair/fur will need to be painted over the background which is easier than trying to paint the background in between each hair. Here I have already completed the background , I simply painted in 'out of focus' effect trees in the background by holding the airbrush away from the paper so as not to leave any sharp edges. 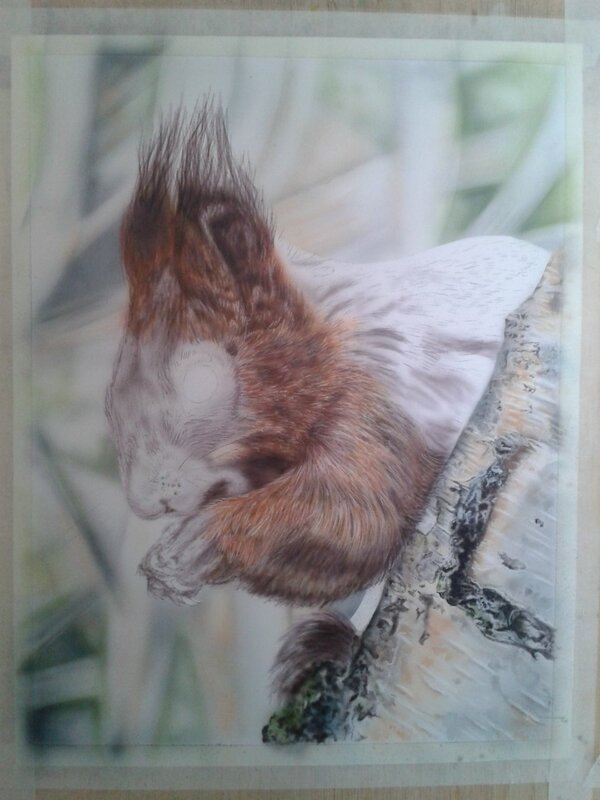 The Silver birch tree took a little more effort , I got in very close with the airbrush to paint very fine detailed lines pulling back where necessary for the shading and lighting effects. 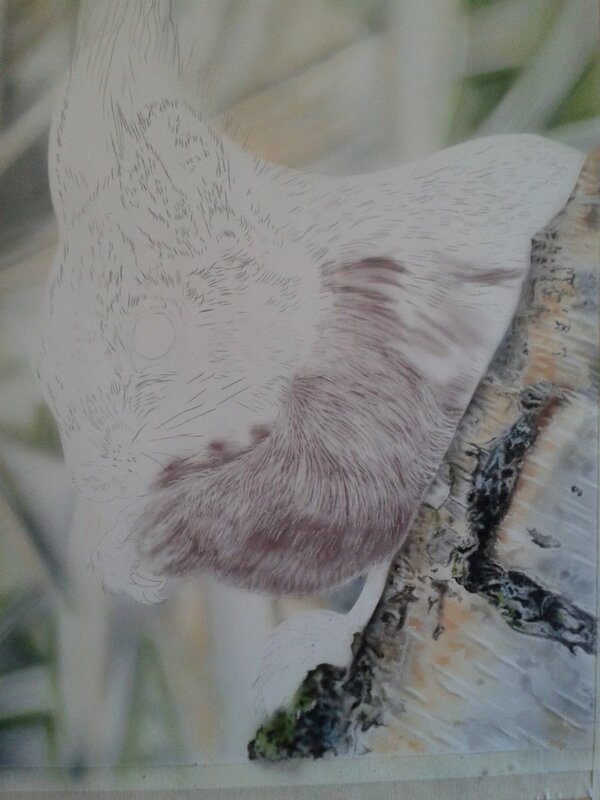 You can also see I have just started on the squirrel itself by first very lightly laying down a base colour to 'map out' the dark/light areas, and direction of fur. 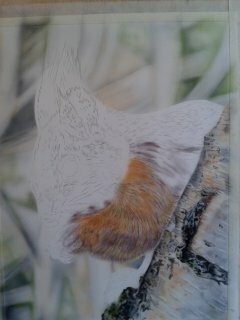 No need to be too accurate at this stage as most of this 'layer' will be covered up as we build up the fur. Notice the sketch lines mentioned in step 1. Step 3: Now I define the 'hairs' a bit more with either an electric eraser or pencil rubber to 'erase' individual hairs, then once I am happy apply a little colour., I am using transparent water colour which means the colour is 'mixed' on the paper so by first applying yellow, I will then apply red which will give me the 'orange' colour I am looking for. By using transparents in this way I can control the shade of the final colour.. 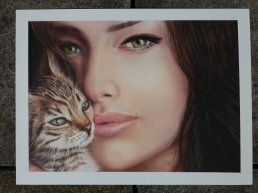 Instead of using an eraser I could have sprayed thin white lines, but white is a difficult colour to airbrush and takes several 'passes' to get a decent bright white line, and any over spray tends to give what is known as 'blue shift' where the over spray tends to look bluish in colour. There are times when I do use white particularly if no dark colours are involved and also on T-Shirts where you can lay a lot of paint down quickly. 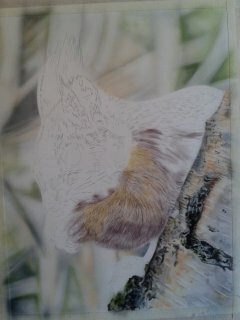 Here you can see the yellow mentioned above has been lightly applied after defining the fur in a bit more detail, i.e. erasing . Here you can see the Red mentioned above has been lightly applied and results in an 'Orange' colour. 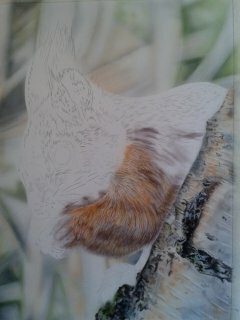 Step 4: Now I repeat the above steps which will build up the layers of fur , erasing more fur detail and applying more colour. As you can see the depth and colour of the fur is now starting to build up nicely. 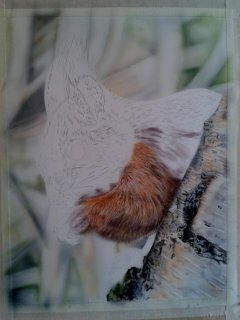 Step, 5,6,7 : More of the same process erasing, applying colour, erasing, applying colour,etc, and also applying shading to further define the fur structure. By erasing individual hairs down to the paper and then applying a 'dusting' of colour the erased hairs are coloured but the surrounding hairs which were not erased will go darker. 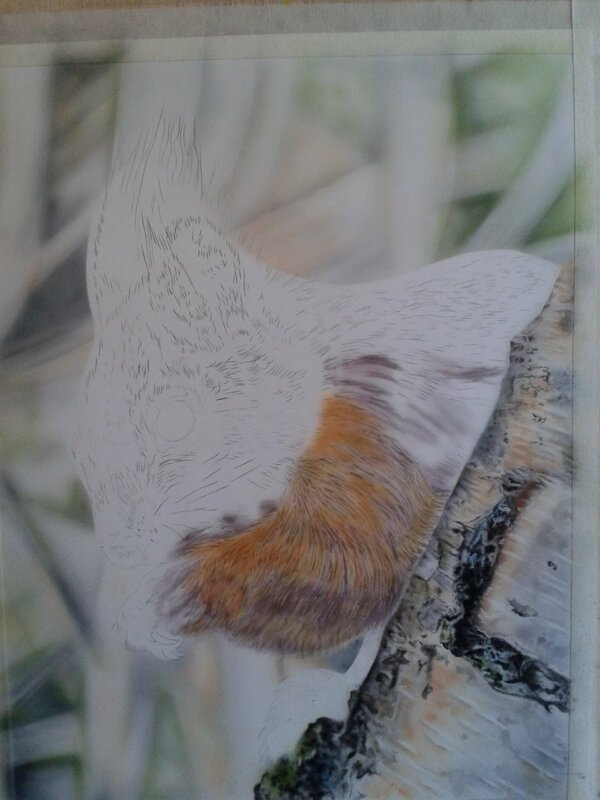 The next time I erase a further set of hairs and apply colour the first erased hairs will get slightly darker and the previous darker still, thus building up 'depth' I just have to make sure I don't go too dark and lose the very first layer. 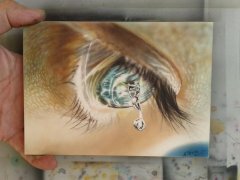 I tend to leave the eyes until last to ensure there is no contamination from over spray which could 'dampen' down the look and feel of the eyes. This has been a fairly basic step by step, I will endeavour to put together a more detailed version as I progress and build up my own knowledge and techniques. Latest Step by Step , a link to a youtube clip showing how I did the Venum T-Shirtt.